One of the perks of having friends in town from abroad is that you get to pick the restaurant. 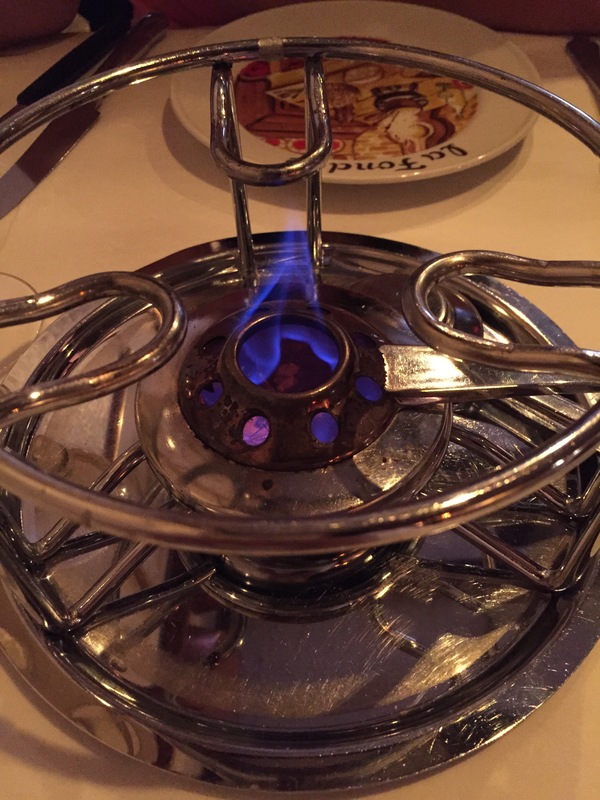 God knows what possessed me to suggest fondue on a pretty warm summer day, but J1 was down with the idea so I finally got my chance to try this little beauty I’d walked past numerous times. We entered and were immediately smacked in the face with the strong smell of cheese (duh!). Given the weather was fairly warm, I was surprised to see that most of the tables in the small space were filled. 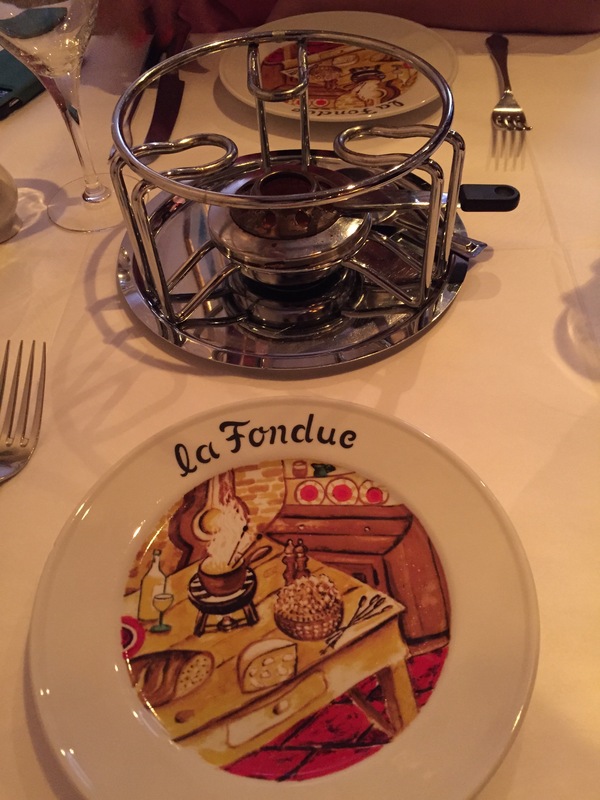 We had a look at the menu and decided quickly on the Fondue Neuchateloise – a mix of emmental and gruyere cheese. Whilst we toyed with the idea of ordering a few other bits, our waitress warned us that the cheese is extremely heavy and that she would suggest that we start with the cheese and then decide if we had space for anything else. The first sign of our fondue arrived in the shape of a camping cooker (sort of thing)..
And within around 10 minutes, we had our own big pot of bubbling, gooey, cheesy cheese. We figured we would start by having the cheese with bread and then half way through when the full extent of the cheese kicked in, we decided it might be an idea to get us some raw veggies. To say that the cheese was good would be an understatement. However from someone who isn’t ordinarily a cheese fan, take my word for it, the cheese was good! It was strong but not too strong and creamy without being sickly, the fresh pepper that was added by our waitress simply added to the depth of flavour! There’s definitely a reason why fondue is the perfect accompaniment to skiing (or so they tell me..) and that’s because once you’ve devoured a whole pot of the stuff, its more than likely that you have consumed your whole day’s calorie allowance – something that wouldn’t be an issue if you were hitting the slopes straight after. In our case following our giant pot of cheese we were both ready to fall asleep and so decided against dessert. 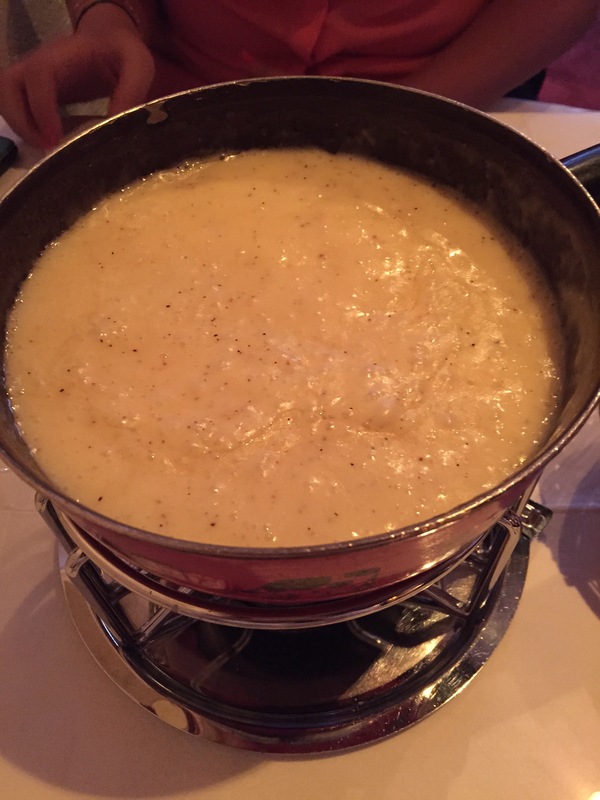 Whilst fondue in the summer definitely works (but leaves you waking up to the sweet (or slightly smelly) aroma of cheese permeating from your pored, fondue is obviously best kept for the winter. So I will be back in the midst of winter to get my cheese on!